By: Clemént Doleac, Research Associate at the Council on Hemispheric Affairs. The OAS is a hemispheric body charged with promoting peaceful settlement of disputes, displaying inter-American solidarity during periods of conflict, and promoting democracy throughout the Americas. However, throughout the Cold War, the OAS repeatedly failed to fulfill these duties when the US government installed and supported strongman regimes throughout the Americas.4 Even the Inter-American treaty for Reciprocal Assistance (TIAR, Tratado Interamericano de Asistencia Reciproca), ensuring respective support by member states in case of war, did not apply during the 1970s when the U.S. government backed the Pinochet coup in Chile, or when the United Kingdom and Argentina clashed over the Falklands/Malouines islands, in 1982.5 Moreover, because of deep divisions within the body, the TIAR excluded Cuba in the name of anti-communism in 1959, and TIAR was controversially not applied during the Bay of Pigs invasion in 1962. In the 1990s, after the Cold War began to wind down, the OAS went through a “revitalization” process, with the implementation of a new set of mechanisms designed to support democratic processes.6 This renewal afforded the body greater relevance, and with the end of the Cold War, the U.S. government began to show less interest in interfering in the Americas through (or independently of) the OAS. The OAS also began to focus more on human rights and democratic procedures through the establishment of the Inter-American Commission for Human Rights (IACHR), and the promotion of Electoral Missions throughout the Americas.7 This movement led to high expectations. This new inter-American system became more independent from Washington, through the promotion of real peace and efficient dialogue. This dramatic shift has been illustrated by the election of more qualified OAS Secretary Generals. Nevertheless, Washington’s residual influence on the OAS is best reflected by its more-than-significant financial contributions to the U.S.-based entity. The OAS is financed by two kinds of funds. First, a regular fund, which is the budget of the OAS, and is filled by internal levies applied by member states in proportion to their respective Gross Domestic Product (GDP). Hence, it comes as no surprise that the U.S. government provides nearly 60 percent of the OAS regular budget, with the Canadian government accounting for nearly 12 percent. Comparatively, the governments of Brazil, Mexico, Argentina, and Venezuela provide a combined 22.5 percent. The regular fund is approved by the General Assembly, and in 2014 it was $83 million USD.12 Every other member state contributes little more than a symbolic amount to the organization. In light of this disparity, it is unsurprising that the U.S. and Canada have a greater amount of influence within the organization. The OAS also receives special donations in order to complete its necessary budget. Member states contribute 63 percent and observer states (such as Italy, France, Spain, South Korea, etc.) account for 25 percent. Donations from other institutions and the private sector also help to finance the OAS’s specific funds. However, nearly 90 percent of the member states’ contributions for these specific funds are made by the US and Canadian governments, which are designated by the $27 million USD and $13 million USD earmarked, respectively, by the North American States.13 The option to provide “extra-funds” is very useful for Washington and Ottawa because these specific funds are administrated by the donors, who choose to finance a specific OAS program. For example the Secretariat for Multidimensional Security (SSM, Secretaria de Seguridad Multidimensional) receives only 8 percent of the regular fund, but nearly 30 percent of the funds allocated to it, principally alimented by the U.S. government. The top executive of the SSM is currently a Canadian, Mr. Adam Blackwell. This difference shows the priority of the U.S. government gives security issues, specifically the War on Drugs, through the use of specific funds. The U.S. government is able to directly influence the programs operated by the OAS. Currently, the Secretary for Political Affairs is greatly dependent on donations from Canada through the Canadian International Development Agency (CIDA).14 In other words, despite the democratic system of one vote per member state, the United States and Canada carry much more influence. Hypothetically speaking, if Washington chooses in the near future to stop financing the OAS, this vital tool of the inter-American system may collapse. On the other hand, it is safe to say that the Secretary General, whoever he or she may be, will never oppose receiving special funding from individual governments as this allows the organization to carry out more initiatives. Given this win-win relationship, Washington will retain its influence over the OAS, even if this is not as clear and evident as before. Some recent issues, such as the Venezuelan crisis in early 2014, illustrated this situation: within the OAS, almost every Latin American country voted for a Resolution, which passed, to support Venezuela’s elected government. On the other hand, the U.S., Canadian and Panamanian governments voted against it.16 The White House seemed at that point completely isolated in the hemisphere. Also, the Secretary General bodies are capable of influencing a large range of specialized secretariats such as the Secretariat for Political Affairs, the Executive Secretariat for Integral Development, the Secretariat for Multidimensional Security, and the Secretariat for External Relations. All these aforementioned institutions allow power projection and participation in hemispheric affairs that other regional mechanisms do not. They allow the OAS to work on technical issues and to depoliticize several issues, avoiding confrontation and diplomatic conflicts between the member states. The OAS should be seen as a technical institution dealing with a common problem, rather than focusing on issues where no consensus can be reached. These institutions also give the Secretary General of the OAS the possibility to choose the organization’s priority. The OAS will behave significantly different depending on the person occupying the Secretary General seat. The Next OAS Secretary General, an Individual or a Political Project? So far, few candidates have been nominated by their respective governments to succeed José Miguel Insulza. The likely candidates are Eduardo Stein, former vice president of Guatemala (2004-2008), and Luis Almagro, Uruguay’s current minister of foreign affairs. The former enjoys the support of Central American countries and the latter has the support of South American countries. Can a New Leader Spare the OAS? Some journalists have labeled the OAS as obsolete and largely unwieldy while many scholars argue that other regional structures will eventually replace it (or at the very least, make it irrelevant).32 The next SG will have a huge responsibility in what will become the OAS. The U.S. government has made steps towards reforming its policy towards Cuba, a campaign promise made by President Barack Obama in 2008.35 The latest and most important step was completed by U.S. President Obama and Cuban President Raúl Castro on December 17, 2014 when the two leaders announced what could be the beginning of the re-establishment of diplomatic relations with Cuba. This included softening of important restrictions on Cuba and the swap of political prisoners.36 Also, both countries are going to attend to the next Summit of the Americas on April 2015, a big step to restore an inter-American dialogue. However, this rapprochement with Cuba would be in conflict with the sanctions U.S. Congress and President Obama have taken against the Venezuelan government just a day before.37 These recent events, if left unaddressed, could lead to a very unpredictable Summit of the Americas. The next SG would also have to address the bureaucratic inefficiencies of the OAS. Moreover, he will have the responsibility to achieve a hemispheric consensus on numerous key issues including the war on drugs, the struggle against inequality, and ongoing human rights issues.38 This can be only effectively achieved by utilizing the reformed administrative and technical capabilities of the OAS and not over-relying on the OAS as a political forum. In the end, no other regional organization can work at the same time on human rights, on electoral observation and on the War on Drugs at the same time. The OAS is still the only efficient inter American administrative body. Finally, the next SG will have the responsibility to resolve the OAS’ internal tensions. These tensions arose between the OAS administrative body and the representatives of Latin American governments, because the administration is promoting free market policies and right wing views on the hemisphere. On the contrary, the majority of Latin American governments which lead the OAS, are more inclined to anti-imperialist foreign policies and anti-free market policies. These tensions are very susceptible to polarizing events, such as the vote backing Venezuelan government in early 2014 for example. 39 Only thanks to these actions, will the OAS be able to regain its status as the region’s key international organization and promote a positive commitment towards an open-handed dialogue and peace changes throughout the hemisphere. 1MERCOPRESS Friday, « OAS will vote for new Secretary General on 18 March 2015: Insulza steps down after a decade » in Mercopress, on December 12, 2014. 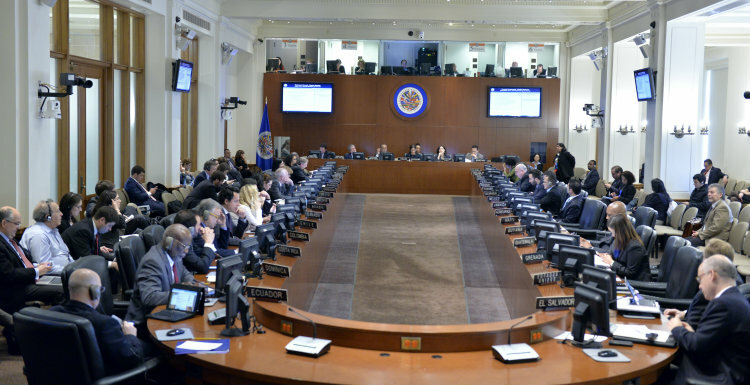 Consulted on http://en.mercopress.com/2014/12/12/oas-will-vote-for-new-secretary-general-on-18-march-2015-insulza-steps-down-after-a-decade on December 16, 2014. 2See also DOLEAC Clément, “Are the Organization of American States’ Imperialist Roots too deep to Extirpate Today? » on Council on Hemispheric Affairs, on December 4, 2014. Consulted on http://www.coha.org/are-the-organization-of-american-states-imperialist-roots-too-deep-to-extirpate-with-today/ on December 11, 2014. 3ARRIGHI Jean-Michel, Max Planck Encyclopedia of Public International Law (MPEPIL), Octuber 2010 ; SUAREZ SALAZAR Luis, Las relaciones interamericanas: continuidades y cambios, CLACSO, 2008 ; LEE Brianna“The Organization of American States”, on Council for Foreign Relations (CFR), April 13, 2012. 4 GAVIRIA C. “La OEA en transición 1994-2004. Democracia” Organización de los Estados Americanos, 2004. Available on http://oas.org/documents/eng/Gaviria2004/01_Democracy.pdf consulted the 28th of Octuber 2014. ; For references about these dictatorships, and US government support to dictatorship in Argentina (1976-1983), in Guatemala (1954-1986), in Bolivia (1971-1978), in Nicaragua (1936-1979), in Haiti (1957-1971), in Panama (1968-191 and 1983-1989), in Brazil (1964-1985), in Paraguay (1954-1989) and in El Salvador (1979-1982) you can look into Hinchey Report, CIA Activities in Chile. September 18, 2000. and GUSTASFON, Kristian C., “CIA Machinations in Chile in 1970”. Retrieved 2008-06-21, 2002. LARSEN, Neil, “Thoughts on Violence and Modernity”. In Grandin, Greg. A Century of Revolution: Insurgent & Counterinsurgent violence during Latin America’s long cold war. Durham & London: Duke University Press. pp., 2010, 381, 391. ; KOSTER R.M. and SANCHEZ Guillermo, In the Time of Tyrants, Panama: 1968-1990, NY and London: W.W. Norton and Company, 1990, Ch. 4. ; JEAN SCHEMO Diana, STROESSNER, “Paraguay’s Enduring Dictator, Dies,” The New York Times, 2006, Retrieved 3 July 2014. ; FEITLOWITZ, Marguerite, A Lexicon of Terror. New York: Oxford University Press, 1998 ; GOULD, Jeffrey, GRANDIN, Greg, & JOSEPH, Gilbert M., ed. On the Road to “El Porvenir”. Duke University Press. pp. 87–120, 2010 ; MOULIAN Tomás, Contradicciones del desarrollo político chileno, 1920-1990, Santiago de Chile: LOM ediciones, 2009 ; MDECONDE, Alexander et al., ed., “Dictatorships,” Encyclopedia of American Foreign Policy, Volume 1. Simon & Schuster. p. 499, 2010. 5TELLO Angel, “L’Argentine et les îles Malouines » in Politique Etrangere, Volume 47, Numero 4, pp. 1005-1015, 1982. 6GAVIRIA C. “La OEA en transición 1994-2004. Democracia” Organización de los Estados Americanos, 2004. Available on http://oas.org/documents/eng/Gaviria2004/01_Democracy.pdf consulted the 28th of Octuber 2014. ; ALBAN GUEVARA Rodolfo, “Civil Society and the Protection of Democracy in the Americas”, FOCAL, May 2006. 8SANCHEZ W. Alejandro, MORRISON Kelly, « The Future of the Organization of American States » in E-International Relations, on August 28, 2014. Consulted on http://www.e-ir.info/2014/08/28/the-future-of-the-organization-of-american-states/ on December 11, 2014. 9COHA « Next leader of the Organization of American States still an Open Question » in Council on Hemispheric Affairs, December 8, 2004 ; ARGUEDAS Carlos and ARLEY Alejandro. « Rodríguez condenado por instigar a pago de dádivas ». Periódico La Nación. April 28, 2011. 10SANCHEZ W. Alejandro, MORRISON Kelly, « The Future of the Organization of American States » in E-International Relations on August 28, 2014. Consulted on http://www.e-ir.info/2014/08/28/the-future-of-the-organization-of-american-states/ on December 11, 2014. 11GAVIRIA C. “La OEA en transición 1994-2004. Democracia” Organización de los Estados Americanos, 2004. Available on http://oas.org/documents/eng/Gaviria2004/01_Democracy.pdf consulted the 28th of October 2014. ; ALBAN GUEVARA Rodolfo, “Civil Society and the Protection of Democracy in the Americas”, FOCAL, May 2006. 14This information is based on interviews with staff members of the OAS. 15SEGOVIA Daniela, “Latin America and the Caribbean: Between the OAS and CELAC,” European Review of Latin American and Caribbean Studies 95, 2013. 16WEISBROT Mark “The truth about Venezuela: a revolt of the well-off, not a ‘terror campaign’”, The Guardian, March 20, 2014. Consulted on http://www.theguardian.com/commentisfree/2014/mar/20/venezuela-revolt-truth-not-terror-campaign on December 16, 2014. 17“Ecuador pidió reformar la OEA para terminar con el tutelaje político y económico de los Estados Unidos” in Telam on October 10 2013 ; SIEGELBAUM Portia “OAS Lifts Ban On Cuba After 47 Years », in CBS News, June 3, 2009. 19 SANCHEZ W. Alejandro, MORRISON Kelly, « The Future of the Organization of American States » in E-International Relations on August 28, 2014. Consulted on http://www.e-ir.info/2014/08/28/the-future-of-the-organization-of-american-states/ on December 11, 2014. 21VAUGHNDELL Joseph, “OAS to elect the next secretary general on March 18, 2015″ On Real FM Granada, on November 20th, 2014. Consulted on http://www.realfmgrenada.com/regional-news/oas-to-elect-the-next-secretary-general-on-march-18-2015/ on December 11, 2014. 23DOLEAC Clément “Are the imperialist roots of the OAS too deep to extirpate today” on Council on Hemispheric Affairs, On December 04, 2014. Consulted on http://www.coha.org/are-the-organization-of-american-states-imperialist-roots-too-deep-to-extirpate-with-today/ on December 11, 2014 ; SANCHEZ W. Alejandro and MORRISON Kelly, « The Future of the Organization of American States », in E-International Relations, Aug 28 2014. 24The Panamerican Post, “Honduran Truth and Reconciliation Commission Releases its Final Report » in the Panamerican Post, on July 8, 2014. Consulted on http://www.thepanamericanpost.com/2011/07/honduran-truth-and-reconciliation.html on December 11, 2014. 25KLAUSS Clifford, “Angry Election Monitor Leaves Peru 2 Days Before Runoff Vote » in The New York Times, on May 27, 2000. Consulted on http://www.nytimes.com/2000/05/27/world/angry-election-monitor-leaves-peru-2-days-before-runoff-vote.html on December 11, 2014. ; The Panamerican Post, “Honduran Truth and Reconciliation Commission Releases its Final Report » in the Panamerican Post, on July 8, 2014. Consulted on http://www.thepanamericanpost.com/2011/07/honduran-truth-and-reconciliation.html on December 11, 2014. 26RAMSEY GEOFFREY « OAS Secretary General Race Kicks Off » in The Panamerican Post, on July 2, 2014. Consulted on http://www.thepanamericanpost.com/2014/07/oas-secretary-general-race-kicks-off.html on December 11, 2014. ; and “Torres-Rivas responde al campo pagado de los ex funcionarios de Arzú” in Plaza Publica, on April 17, 2013. 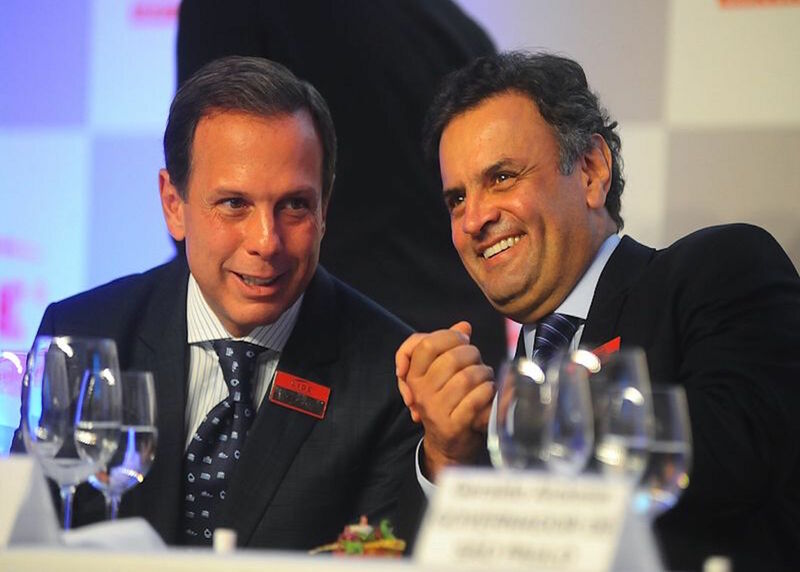 Consulted on http://www.plazapublica.com.gt/content/torres-rivas-responde-al-campo-pagado-de-los-ex-funcionarios-de-arzu on January 22, 2015 ; OPPENHEIMER Andres, “Stein: OAS needs to put house in order”, Miami Herald, on November 8, 2014. Consulted on http://www.miamiherald.com/opinion/issues-ideas/article3669707.html on January 22, 2015. 27LUZZI Leonardo “Almagro sobre Venezuela: hay responsabilidades equilibradas en ambos bandos” in El Observador, on February 26, 2014. Consulted on http://www.elobservador.com.uy/noticia/272581/almagro-sobre-venezuela-hay-responsabilidades-equilibradas-en-ambos-bandos/ on December 16, 2014 ; and REYNOLDS Louisa, “La declaración sobre drogas que hace dos años era imposible” in Plaza Publica (Guatamela), on June 16, 2013. Consulted on http://druglawreform.info/es/publicaciones/sistemas-sobrecargados/item/4831-la-declaracion-sobre-drogas-que-hace-dos-anos-era-imposible on December 16, 2014. 33 BIRNS Larry, MILLS Frederick, PINEO Ronn, “Ramifications of Venezuela’s Seat on the UN Security Council » in the Cutting Edge News, on October 22nd 2014. Consulted on http://www.thecuttingedgenews.com/index.php?article=85474&pageid=44&pagename=Slices on December 04, 2014. Consulted on http://www.thecuttingedgenews.com/index.php?article=85474&pageid=44&pagename=Slices on December 04, 2014. 34 EFE, “Candidate to lead OAS says Cuba shouldn’t be excluded from regional summit” in Latino Fox News, published on October 16, 2014. Consulted on http://latino.foxnews.com/latino/politics/2014/10/16/candidate-to-lead-oas-says-cuba-shouldnt-be-excluded-from-regional-summit/ on December 04, 2014. 35REYES Angelica “Could Ebola Improve US-Cuban Relations? » in Council on Hemispheric Affairs, on December 12, 2014. Consulted on http://www.coha.org/could-ebola-improve-us-cuban-relations/ on December 16, 2014. 36 See BIRNS Larry. DOLEAC Clément, “Alan Gross Released: Towards a Turn in U.S. – Cuba Relations” in Council on Hemispheric Affairs, on December 17, 2014. Consulted on http://www.coha.org/alan-gross-released-towards-a-turn-in-u-s-cuba-relations/ on December 18, 2014. 37MILLS Frederick & HØJEN Louise, “U.S. Sanctions Against Venezuela: A Wrong Turn For Regional Diplomacy” in Council on Hemispheric Affairs, on December 15th 2014. See more at http://www.coha.org/u-s-sanctions-against-venezuela-a-wrong-turn-for-regional-diplomacy/ on December 18, 2014. 38SALAMA Pierre, Les économies émergentes latino-américaines, entre cigale et fourmis, Armand Colin, 2013. 39 Ibid ; DOLEAC Clément, “Continuity of Left Wing Government in Latin America” in Washington Report on the Hemisphere, November 2014.; DABENE Olivier « Consistency and resilience through cycles of repolitization », pp. 41-64 in Riggirozzi, Pia, Tussie, Diana (eds. ), The Rose of Post-Hegemonic Regionalism. The Case of Latin America, London, Springer, 2012. ; DOLEAC Clément, L’Organisation des États Américains (OEA), d’un organisme hégémonique a un organisme multilatéral?, Mémoire de Master, Institut d’Études Politiques de Grenoble, Septembre 2014.